I love a tiny, healthy animal. Like the teacup pig? Obviously I’m crazy about them, because I’ve featured them twice due to their adorable nature. Then, I saw Einstein, the newborn miniature horse. 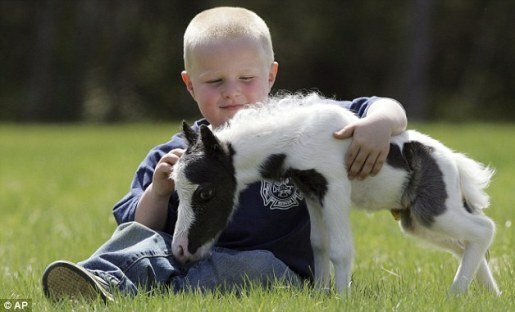 Now, miniature horses are small in general, but Einstein is possibly the smallest miniature horse ever born. At birth, he was 14 inches tall and weighed only 6 pounds. The world’s current smallest pony, Thumbelina, was a comparatively robust 9 pounds. Interestingly, Thumbelina was so small at birth because she has dwarfism. Einstein doesn’t, according to his co-owner Dr. Rachel Wagner; he’s just a naturally tiny horse. It goes without saying that I could just eat that adorable little critter up with a spoon! If you’d like to see Einstein, head up to Tiz Miniature Horse Farm in Barnstead, New Hampshire. When I finally make a million dollars off PopFi, I plan on buying a farm and having a bunch of fun animals. Pygmy goats, woolly pigs, tea-cup pigs, Einstein the miniature horse… I just want a bunch of sweet, tiny animals and one giant dog.